I’ve been wanting to make these cupcakes for ages and they were definitely worth the wait. The caramel cream cheese buttercream is probably one of the best buttercreams I’ve tasted for a while – the texture was so smooth and silky and it had just the right sweetness. I could have eaten the whole bowl! 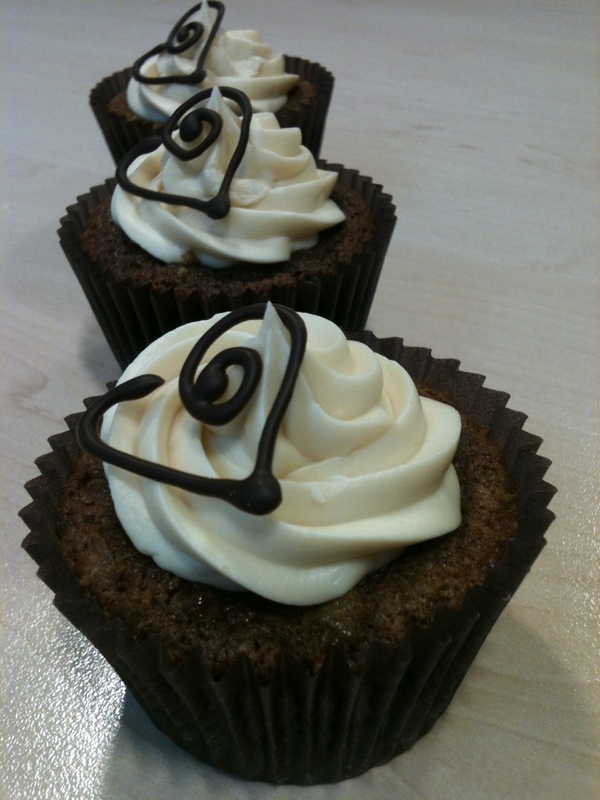 I made these for the Comic Relief Bake Off in the office which was a bit of a risk given I’d never made them before. But I decided that all the other recipes I’ve tried from Peggy Porschen’s Boutique Baking book have all been really tasty so these would be too and they didn’t let me down. I decided to leave the walnuts out since I know not everyone likes them, but I think they would have added an extra crunch which would have made these perfect. As it was they were delicious – just like a sticky toffee pudding should be…. rich and gooey. Preheat the oven to 175 C. Line a 12 hole muffin tray with cases. Place the chopped dates in a bowl and pour over the boiling water. Leave to soak for 20 minutes then drain (if there’s any water left) and break/chop the dates into smaller pieces. Add the vanilla extract. Once all the egg is incorporated, fold in the remaining flour followed by the soaked dates. Stir until the batter is just combined then divide between the cupcake cases. Each should be about two thirds full. While the cakes are baking, make the sugar syrup by bringing the sugar and water to the boil in a small pan. Simmer until all the sugar crystals have dissolved. Set aside to cool slightly. While the cakes are still warm from the oven, brush the sugar syrup over the cakes using a pastry brush. Once completely cool, chill the cupcakes for one hour, or until the cake feels firms to the touch. Then, using acupcake corer take a core out the middle of each cake, place a teaspoon of caramel in the hole and then replace the core. Alternatively, using a melon baller or teaspoon, scoop out the tops of each cupcake – then place the dulce de leche in a piping bag and pipe into the scooped out centre of each cupcake for your caramel core. For the buttercream, beat the cream cheese in a mixing bowl until light and creamy. Beat the butter and icing sugar in a separate mixing bowl until very pale and fluffy. 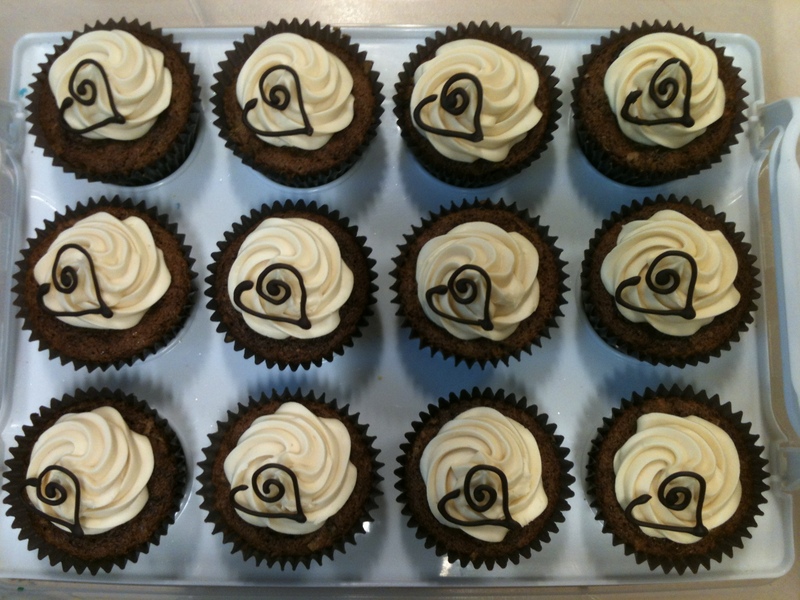 To ice the cupcakes, fill a piping bag fitted with a star nozzle and pipe a swirl of frosting on each cupcake. 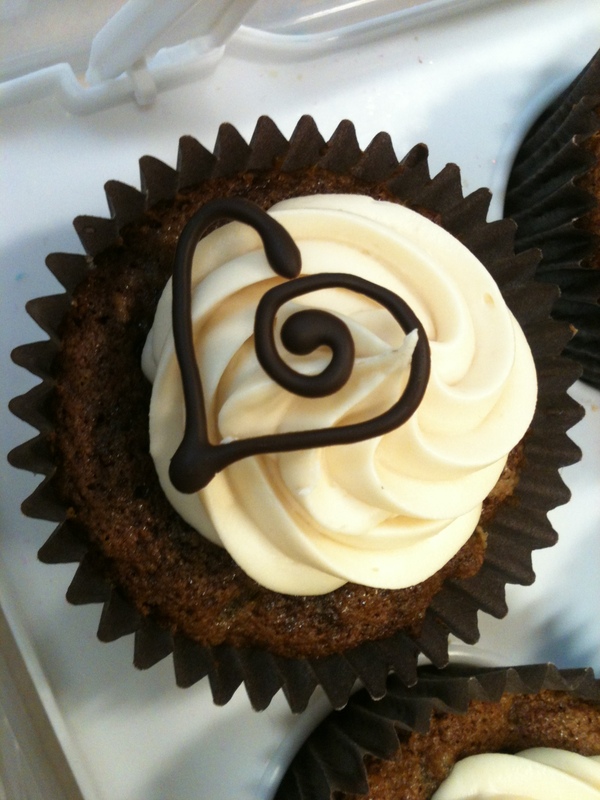 I piped swirly hearts onto greaseproof paper using a piping bag filled with melted dark chocolate. Once they had set, I peeled them off and then “hooked” one over the top of each cupcake to finish them off.